The city itself is really important to the plot in a visual sense. I’m leaving a lot of clues around. There is actually about 30% more background art than there was two weeks ago, to give you an idea of how much my drawing claw aches. Anyway, I don’t often write down the specifics of what I do on this blog, I tend to leave those on devlogs, such as on TIGsource… but I thought I’d share every stage of the process from now until completion, once a week if possible, as a kinda motivating factor. I’ve decided I can easily release the game in a tighter form, and add additional ways to look after You, sidequests and so on, without throwing the balance of the game off, at a later stage. I’m still going to put in everything I realistically can, though. Next week I’ll try and share some behind-the-scenes stuff, to show you how it’s all put together. I’ve been meaning to do this a long time, and if I write it down here, I may feel guilty enough that I have to do it! 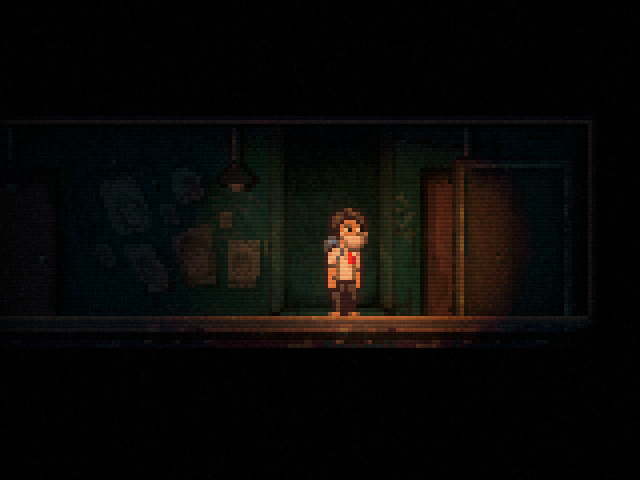 For the last six months, I’ve been ‘just about to start the city’ environment in Lone Survivor. Instead I’ve been honing the first three worlds to a finished standard, gradually adding, changing and even dropping mechanics. The game has got a lot wider, but very little longer. The IGF version I put together, as with all the others since before my Indiecade entry, ended with You stepping out of the Wing Court Apartments onto the street for the first time. That door has always led nowhere, and that fact has become increasingly daunting. Well I’ve finally broken that barrier, and I’m working hard on the new area. It took a long time to work out the scope, and eventually the map I was going to use. It’s still likely to change as I have a time-budget now I can’t really afford to run over, so cuts will be made if need be to simply get this game out the door! There’s plenty of stuff to do in LS already, so I’m not going to pad the content out if it doesn’t need it either. So in the city I plan on having a couple more sidequests like the coffee ones. Even though these are not crucial to beating the game, and add time to development, the flavour they add I think is essential to the game’s subtext. My inspiration is definitely Deadly Premonition in this respect, a game I loved very dearly. In fact the more this project rolls on, the more I realise I’ve subconsciously been influenced by its mechanics – not just the coffee! 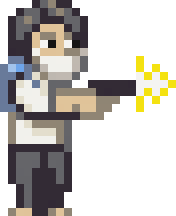 Somehow I managed to maintain the adrenaline post-IGF-deadline, I’m sure I’ll crash horribly at some point and have to take a week off, but I’ve been expecting that… Just figured I’d ride the wave of inspiration while it’s there! I have at least been taking some quality time with the family, and with DARK SOULS. Anyway, not so with Lone Survivor, or so I hope. Although my work tends to be fairly tightly scripted, for once I see a game where the story is loose enough to work in a number of different ways. The story focusses on the minutiae, the details of the daily routine, and this can vary enormously without affecting the plot. I’ve already got the stove in the apartment working, and that’s really gonna help cheer up You’s world, along with a number of other cool items which almost work in a side-quest manner. Well, the less I reveal the better I think, but this should give you an idea of where I’m heading with it. Where the game differs massively from Minecraft and other survival games such as Terraria or Project Zomboid is that it is mostly linear adventure, with a fixed plot. The ending is determined by how you play, but there are fixed scenes and puzzles. It’s the details that change, as there’s a lot of (seemingly) pointless stuff to do in the world. Although you’ll have to believe me when I say that everything you can do has some purpose! I’m keen that people don’t try to ‘figure out / exploit’ the system, at least on their first playthrough. That they just explore, play naturally, and see what happens. 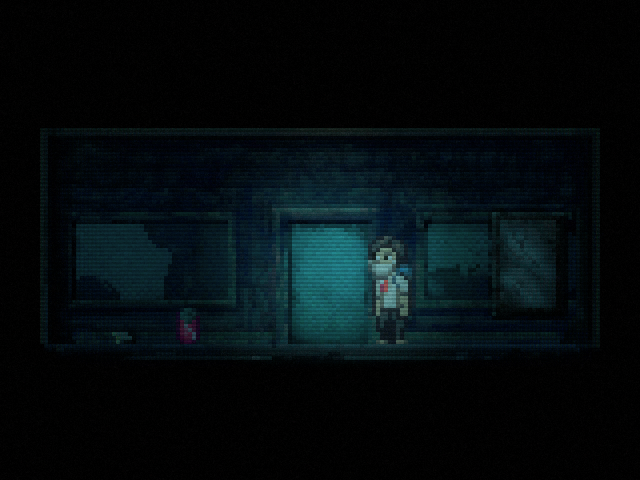 Those that read my blog and twitter feeds will probably have much more of an idea of what the underlying systems are, but I think for the most part people will approach it like a normal survival horror game, which I’m kinda banking on for it to have its full effect. I got the game into the IGF compo on time! With loads more features than planned! Put a lot more time into the diary and radio which give hints. They provide a recap and a short term goal / long-term goal respectively. They still need more work, but they really help with the key points people were getting stuck in feedback I’m recieved. I also added ‘special fruit salad.’ In the following weeks, as well as adding new areas and a few new surprise items for stealth-play, I’m going to focus on the food-crafting aspect of the game. There will be a way to activate You’s stove in his apartment, is all I’m sayin’. Thankyou for covering the game, Rock Paper Shotgun! Having read the initial batch of comments I feel the rare urge to respond in some way, and that, rather than clog up the thread there, I’d leave them here. First of all, I should note that this post explains some of the intent of the game which you may not wish to know in a spoiler-sense. I tend to dislike games with unnecessarily-realistic / glorified violence in general, it’s a bit of a theme in this game, and others I’ve made… In fact this is the first game I’ve made with a gun. 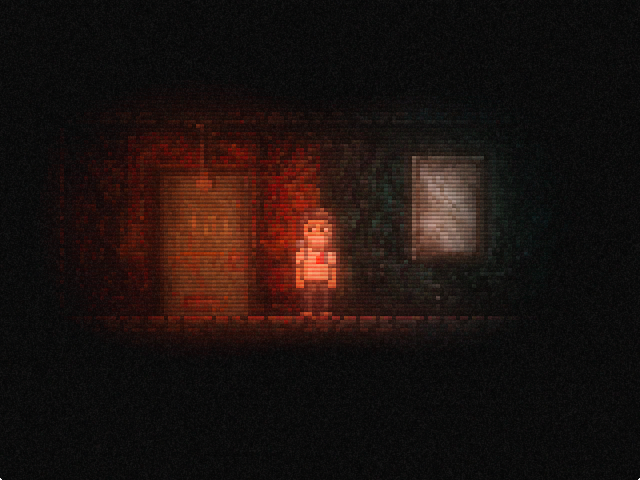 I’ve made a big thing out of the fact that you can get through the game without killing anything, and that taking pills, killing or eating rats is entirely optional… and the game will recognise this. I want to make a game where you think about the consequences of picking up a gun. Some drugs can even be beneficial too though, right? That’s another question I’m thinking about a lot. 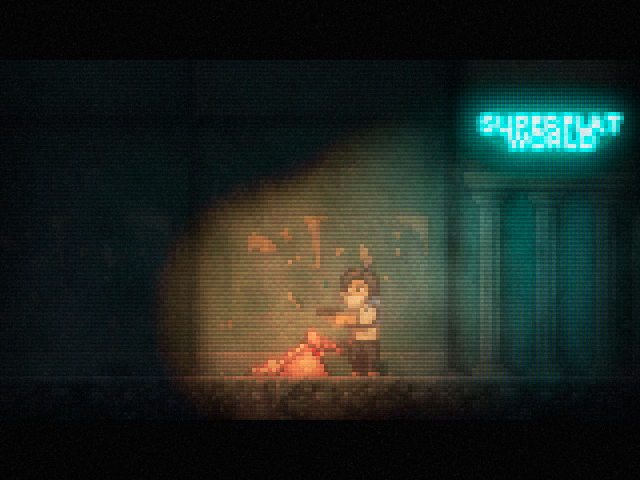 It’s a game about looking after yourself as best you can, in a bad situation. Some players may relish exploring the darker aspects, but I’m betting the majority stay clear, at least in their first playthrough. Don’t get me wrong, I’ve played and continue to play games which are violent, as combat is so frequently the main mechanic… but I’m more choosy about which ones I enjoy now, either it’s light-hearted and cartoon-ish, or it has some purpose to its portrayal of realistic violence, besides to shock. Silent Hill 2 continues to be my principle inspiration here, as the nightmares were things a man with psychological problems had conjured up, abstract and representative. 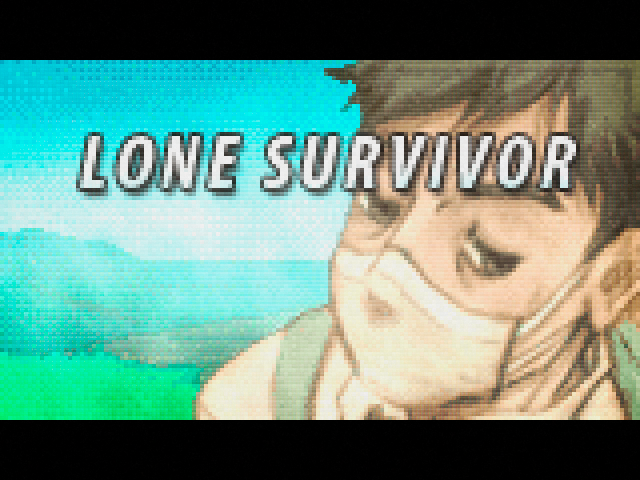 Lone Survivor is not a game about zombies. I remember being quite turned off by a popular game whose principal USP on the back of the box was ‘strategic dismemberment.’ Lone Survivor attempts to provide (far less realistically portrayed) options for committing violent acts, but attempts to draw attention to just how weird / disturbing it actually would be to do them through the text. The game is slowly paced, the fights are quite rare, as are the few moments of gore. I hoped that by making it in a very low resolution it wouldn’t be visually shocking, but it’s perhaps turned out more so than I imagined. There is a very positive ending to this game, if you play it in a certain way. I want it to be full of hope. Anyway I hope that explains my intentions with the game a little better! Just over three weeks to go… Will it all be done in time? I know one thing, that the game has become something else entirely this last month or so, since I took a break from it. 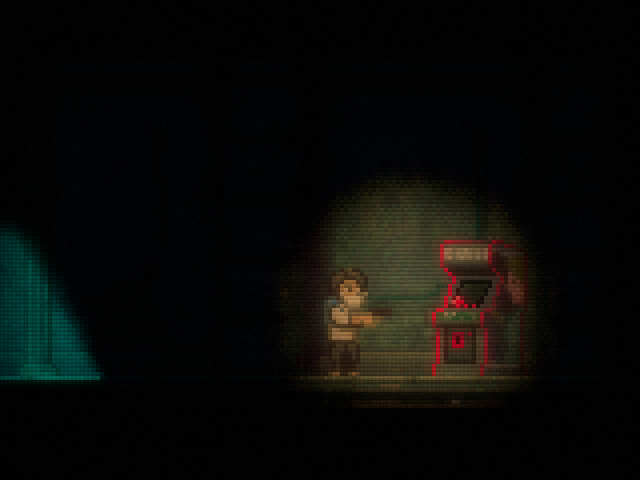 It’s really helped and I’ve come up with something that feels no longer like a remake of old survival horror, but more like a new mashup of various things that I can’t really put into a category. There’s a real nurture element to it, you are now linked with your apartment at almost all times, and you’ll need to rest your guy there and plan your routes as it’s the only place that’s safe. Hopefully you’ll enjoy the picking of the right food for the occasion, or the right drug in case of emergency. 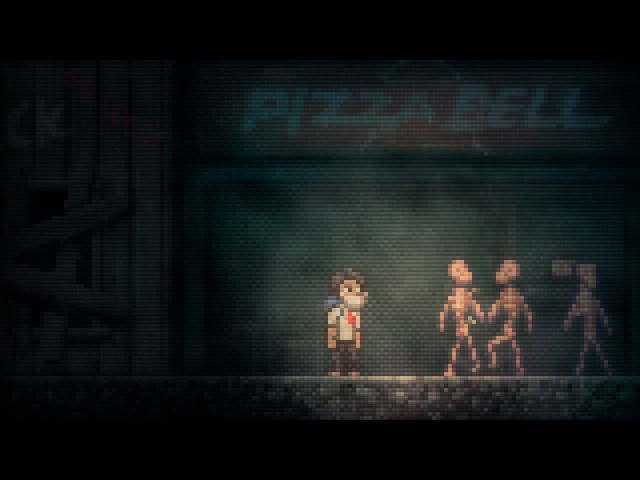 You may be able to find your way around all the monsters without even harming them at all. 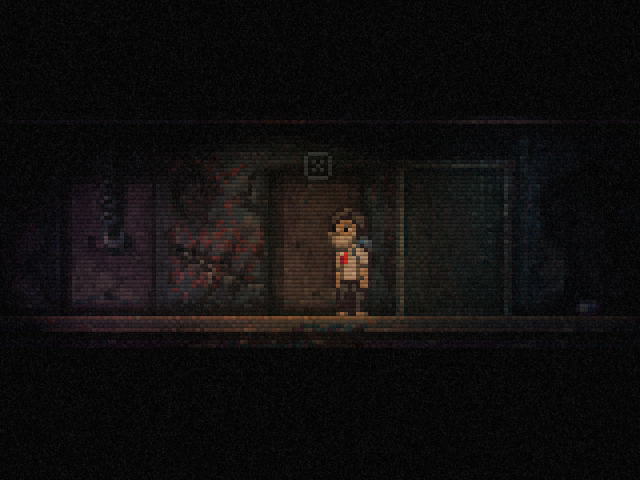 I’m very, very lost with Lone Survivor right now. The stuff I’ve been adding has just made the game far more complicated, not necessarily better as far as I can tell. I seem to be heading down a path where there’s almost too much content for one person to create. I’m not actually sure I can finish it at all at this point, but maybe with some space between me and it, I can figure it out. Maybe not, and if so, that’s just how it was meant to be. In the meantime I will be experimenting with a number of small things, nothing in particular. I may have to get a job too, as I can’t support this kind of procrastination financially! I was giving some proper thought to returning to the ‘big game’ industry, but then I realised I should probably put some distance between myself and games for a while. I might try and get a really normal job, one that’s not creative for a change, just to give me some breathing space to think about what I really want to do, indie-games-wise, and life-wise. Now my plans have changed a lot in the past few years, even from month to month, so it’s hard for me to predict if this hiatus will be short, long or even permanent. I just wanted to let you guys know, and to say thankyou to you all for all the support for this game and others I’ve made. So for now at least, it’s goodbye from me, and goodbye from You!